Ninesky is the most suitable browser for Android mobile. It is smarter and faster than other browsers. Ninesky pays more attention to your Internet security and protection of personally private data. Speed Dial and Smart Address Bar can help you more conveniently and fast type the URL on the mobile. You can use Cloud Bookmarks functions share your bookmarks in different mobile devices. You do not need worry about losing the bookmarks when you lose your mobile or change it. That is because as long as you sync the Cloud Bookmarks to your new mobile, you will get it. There are three wonderful search engines in Ninesky browser. You can select your favourite search engine in Google, Bing and Yahoo. It can support all the HTML5 and WWW web pages. You can use it play FLASH on the online video websites. 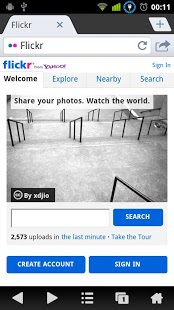 More improvements are about content sharing, easy using and user experience mode. We hope you will love Ninesky browser and help us improve it. Let us create a wonderful mobile browser together. –	Powerful secure protection including detecting security of sites. There will be warnings when dangerous websites are attacking. We will protect you personally private data. –	There are three wonderful search engines in Ninesky browser: Google, Bing and Yahoo. –	You can have your own Cloud bookmarks in Ninesky browser and you can sync your local bookmarks to your Cloud bookmarks. Doing that can more safely protect your data. –	There are eight speed dials on the homepage. 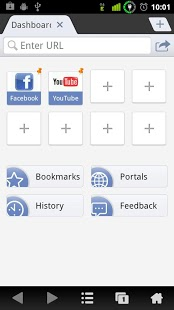 Ninesky browser presets two popular websites for you: Facebook and YouTube. –	You just need type a few letters or key words of the website that intelligent address bar will automatically match the popular websites, your bookmarks or browsing history for you. –	You can conveniently use the Ninesky browser download images and files. Download icon will be displayed in the system message bar. 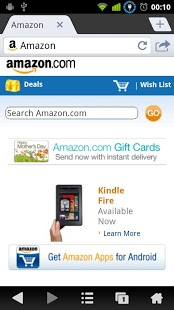 –	Browsing tabs makes browsing the mobile web as easy as using desktop. Do not need leave your webpage that you can open others website. –	Ninesky browser provides an amazing browsing experience with Multi-Touch Zoom. On the screen, using two fingers can easily make the text bigger or smaller. Meanwhile, double-click the screen can zoom the page. –	There are three “Internet Modes” can be chosen: Saved traffic mode, No trace mode and Web optimization. –	You keep pressing the links, words or images in the page when you are browsing, there will be showing some shortcuts: open in new window, save bookmark, share content, save picture, set wallpaper and so on. –	Install applications or file to your SD card. Your mobile memory will be saved and will run faster. –	View switch function is so sweet. You can freely switch your view between computer and mobile. you can switch the view in Android, iPhone Safari, iPad Safari, Desktop Chrome and Desktop Firefox.